Ballinskelligs is the home of the famous Skellig Monks who, according to legend, travelled across Ireland to find ‘a paradise on earth’. While they settled on Skellig Michael, they found a winter home on the mainland in Ballinskelligs, and when they eventually left they island for good, they settled here too and founded the Abbey, which you can see from the beach. Early Irish monks, wishing to emulate the sacrifice and pure withdrawal into a life of faith exemplified by St. Anthony going out into the desert, found a parallel experience—the remote and deserted Irish offshore islands. The monastic ideal was to demonstrate an intense devotion by such extreme acts of self-exile: peregrinatio pro Dei amore, ‘pilgrimage for the love of God.’ Here, the love of God was brought to a new level, as no other Irish monastery was built in such a challenging location. 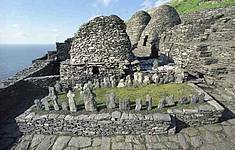 The establishment of the monastic settlement on Great Skellig is, according to local lore, credited to the sixth-century St. Fionán, a significant South Kerry saint who founded Innisfallen Abbey. 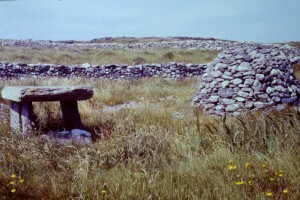 The site drew its support from the local Corcu Duibne (Kingdom of Kerry) dynasties. In the ninth century the idyllic but challenging life on the remote monastery was made even more challenging by the rampaging Vikings, who may have believed that the rocky refuge held either valuable objects to pillage or important men to be held for ransom. ‘In 824AD Scelec was plundered by the heathens and Étgal was carried off into captivity, and he died of hunger on their hands. The reputation of the Norse invaders likely preceded them to the monastic island. Their terrifying habit of burning villages and slaughtering the inhabitants included, according to some sources, the horrific practice of the ‘tossing of infants on top of their lances to and from each other.’ The different flights of steps on three sides of the island, while providing the monks the convenience of landing their boats in different seas, also gave the invading Vikings the means to attack the monastic site from different sides simultaneously. It may be that the extremely difficult-to-access remote hermitage on the South Peak became the sanctuary of last resort. In an ironic and likely apocryphal local legend it is told that in 993 Viking Olaf Trygvasson, later to become Olaf I, King of Norway, was intent on a raid of the monastery but instead was baptized into the Christian faith by a Skellig hermit. His son, Olaf II, became the patron saint of Norway. By the 13th century Irish Christianity was transforming itself from the Celtic Church’s monastic model to the diocesan structure of the Anglo-Normans. This political change, as well as colder weather and greater winter storm activity, forced the monks (by now Augustinians) to abandon the island and recreate their monastery on the mainland at Ballinskelligs. 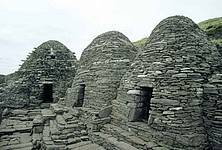 A monastery may have been founded as early as the sixth century, reputedly by Saint Fionán, but the first definite reference to monks on the Skelligs dates to the eighth century when the death of ‘Suibhni of Scelig’ is recorded. Skellig is referred to in the annals of the ninth and tenth centuries and its dedication to Saint Michael the Archangel appears to have happened some time before 1044 when the death of ‘Aedh of Scelic-Mhichíl’ is recorded. It is probable that this dedication to Saint Michael was celebrated by the building of Saint Michael’s church in the monastery. In the thirteenth century a general climatic deterioration resulted in colder weather and increased storms. This, together with changes in the structure of the Irish Church, signalled the end of the eremitical community on Skellig Michael. The monks appear to have moved to Ballinskelligs on the mainland at about this time. The Prior of the Augustinian Abbey at Ballinskelligs was referred to as the Prior de Rupe Michaelis in the early fourteenth century, implying that the island still formed an important part of their monastery at that time.